This girl probably doesn't need any introduction by now. Here she is! WARNING: EARLY EDITION. Most is good to go, but Poses might need minor adjusting per character, for example. Also, it is highly recommended to get the FREE DEMO version since it has a nice introduction Scene for you. Over the next few months expect an update or two as I also will start experimenting with this girl. Believe it or not, during the development stage I have little time to play around with her. Its important for me to do that because it will immediately show where she could use some improvements. Please relax into this project, read the documentation, be patient, take your time to get to know her. Hang out at Smith Micro Poser forums, Renderosity forums and obviously also here. I answer when I can. There are quite a few beta testers that have been experimenting with this figure for about a month now, they pretty much know the deal! They'll probably find you too if you have questions in the forum. Below is more detailed information about Project Evolution! Project Evolution started off in Malawi 2014 as 'Project E' in response to underwhelming Poser figures that were being produced time-and-again. 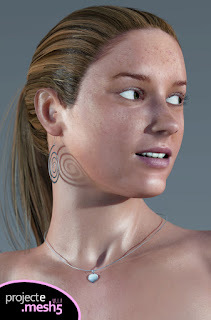 For years I had immersed myself in Poser and I knew what it was capable of, despite its issues, and could not accept having to see my friends struggle with persistently lifeless CG girls. In a world where the beauty of the female human has inspired poems, books and entire wars, where some of the oldest carvings are of women, it seemed wrong for a crowd of over-eager CG artists not to be able to partake in this ancient tradition. And yet I was effortlessly doing just that by myself. I made my own female characters over and over again. It was then that I decided that I needed to share this with my friends and art-buddies. This is Project Evolution. I withheld the name until very recently, because even though I made my own figures, I was not sure if I could pull this particular one off. Making a figure for yourself is one thing, making a figure for thousands of extremely diverse artists is another thing entirely. It was a big risk to take, with failure being very real. But I figured if I could use a figure like this in my art, I'm pretty sure others can too... maybe not all, but perhaps just enough to kick off a fun and lasting trend. Half way the project I was close to giving up, I encountered too many issues and didn't feel confident that this figure would be manageable for other people... but I kept getting reminded of the fact that I was working with a very awesome self-made Poser figure. And still my friends had nothing to play with. So, slowly I picked it up again, ignoring the issues, and with the relentless help of some dedicated Poser veterans, finally she started to develop into a proper woman. And when I could see the light at the end of the tunnel, I felt confident enough to reveal her true name. I named her Evolution also in response to the constant re-invention of the wheel when it came to figures. How many versions of human are out there? I don't remember any Homo Sapiens v2.0, 3.0 or 8.0. That's because there isn't. Yet why is it that we always have to start all over again when someone creates a new figure? Sure, its nice to get something new once in a while, but we cannot always afford to re-stock our closets with new clothes. Besides, most of us grew up wearing hand-me-downs, right? And if vendors are constantly busy repeating the same content over and over, when do they get to improve their stuff? Instead of the usual tshirt, now an addon pack with new prints, or new morphs and bones to make it flutter in the wind. But Evolution is a big project, bigger than I anticipated. It tries to achieve a lot of things, among others to show off what Poser can do, to be a versatile female figure for many different artists out there, to overcome a deep trauma in the Poserverse, to introduce a radical way of rigging, the type that was only used sparingly before, and also introduce a way to speed up content creation (with the Evolution Content Development Kit). I had my deadline set for Xmas 2017, because after over 3 years it was time to draw a line and throw her into the wild, but even at the deadline, there was so much still left to do. Which is why I present you with the Early Edition. The Early Edition is basically the complete package, with a few things that still remain to be refined. But its a perfect opportunity to also show her to the world, and see what everyone thinks of her. In the next few months I will be listening and taking notes, as well as making some addons and helping friends make content for her. Be patient, but let us know what you think. Yes, I'm not asking much for it for now. 30 bucks is nothing for this girl, but I also don't want you to have to deliberate about this girl. She's ready when you are. I want art to be about impulse, inspiration and spontaneity again, not about hard choices and bargaining. I hope Evolution will inspire you and put your mind at ease when it comes to Poser. But, I also hope it will inspire SM to refine their understanding of Poser and its meaning to the men and women that use it, and thereby invigorate their approach towards it. For now, this is about us. Me and you, and our art. I modeled this girl after my personal comic figure the 'Erogirl', which is not half as refined as this girl is. Everything I learned from making the Erogirl, went directly into this lady. I've been so deeply invested in the development of this girl that not even I've had a proper chance to see her operate in a comic production environment. So will you join me in this adventure and see what she can do? I will do what I can to refine her further, but I also hope vendors will step in and help out. Because then the party really starts! Andrew, Biscuits, Wim van de Bospoort, Ghostman, Snarlygribbly, Scott Shaver, Jenn from Renderosity, my super-eager beta team, Terri, the CGbytes testers, my girlfriend, my mother, Bwana Amos, and of course my overly patient friends, collegues, and fans! Thank you all!!! Wanna finally play with a new and crazy ambitious Poser figure? She's finally here!